They demanded their release from Luhansk captivity. Fans of Dynamo Kyiv, Shakhtar Donetsk and Zorya Luhansk football clubs as well as public activists marched in Kyiv on 5 November, according to an LB.ua correspondent. 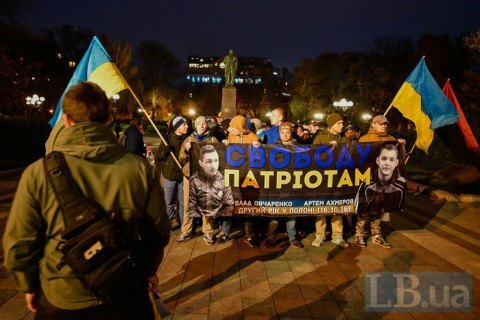 The march was held in support of Vladislav Ovcharenko and Artem Akhmerov, fans of Zorya who were convicted by pro-Russian separatists in Luhansk over Ukrainian symbols to 17 and 13 years in prison respectively. The campaign organisers said that Ukraine had not included Akhmerov in the list of prisoners for exchange. Ovcharenko's release did not work out. Luhansk separatists detained them in October 2016 over their alleged links to the Azov regiment and found them guilty of espionage. After the start of hostilities, Zorya FC left Luhansk and moved to Zaporizhzhya.